When I headed to the Arcade to start the 24 Hours of Elvis, I got a little bit nervous that the restaurant’s Elvis booth wouldn’t be available. I spent most of the drive from my house working out a bunch of plan-B options just in case. As it turns out, I shouldn’t have worried. 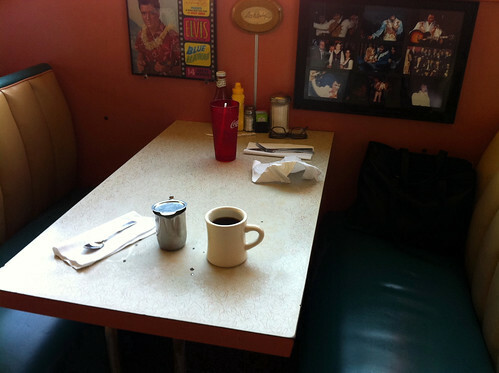 The cafe was pretty quiet, and I was able to head to the back and take a seat at the Elvis booth. It’s known that Elvis liked to eat at the Arcade, and I’m assuming that this is where he sat when he did so. Just, imagine it without so many Elvis photos – it would probably get awkward eating under pictures of yourself. 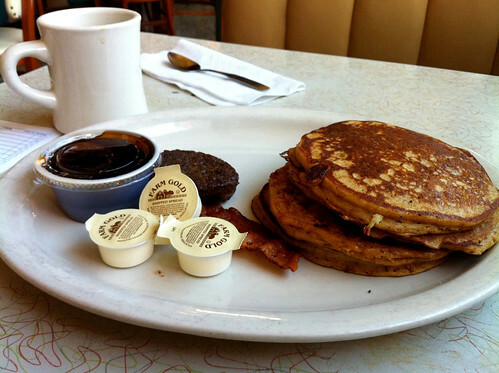 For breakfast, I had some coffee, a big stack of the Arcade’s perfect sweet potato pancakes and a side of half bacon, half sausage. If this is what eating like Elvis is like, then sign me up. 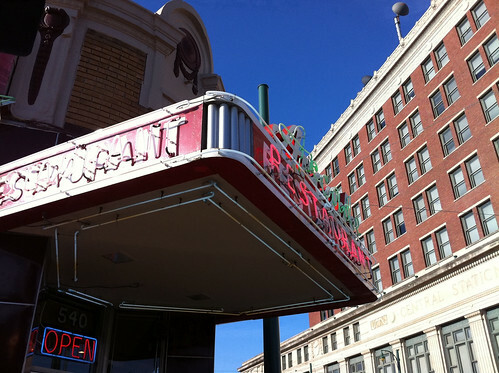 The Arcade claims to be the Oldest Restaurant in Memphis (it opened in 1919). Until the early 1960s, the diner was open 24 hours a day. I wish the intersection of S. Main and G.E. Patterson was still busy enough to support a 24-hour restaurant. I’d be there, for sure. I love the Arcade and have eaten there when visiting Memphis from Iowa. Just wore my Arcade shirt yesterday..